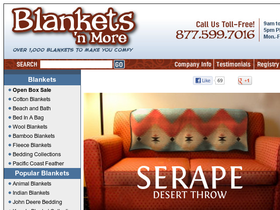 At Blankets 'n More, online at BlanketsnMore.com, is your place to find over 1,000 comfy blankets to keep you comfy. Blankets 'n More offers a huge selection of different blankets made from different materials. Blankets 'n More offers cotton blankets, wool blankets, animal blankets, fleece blankets, and much more. Even find beds in a bag, bedding collections, and tons of themed blankets such as holidays, animals, indian and more. So check out all the Blankets 'n More andd remember to stop by RetailSteal to find the best Blankets 'n More coupon codes, Blankets 'n More promotions, and Blankets 'n More discounts. Blankets 'n More offers shipping only to the USA lower 48 states. Shipping rates vary with total order costs. Se website for full details, exclusions may apply. Use this coupon code at Blankets 'n More to save 10% on your purchase. Save $10 on your purchase of $100 or more at Blankets 'n More when you enter this coupon code at checkout. Check out the wide selection of fleece blankets at Blankets N' More, now from only $39.95. Buy open box blankets for as low as $40.95 online at Blankets 'n More. Click link to buy. Act now and enjoy free shipping on select blanket purchases from Blankets N More.